Devin Brautigam, of Sidney, launches his drone for photographs over Sidney, recently. “Simple Symmetry” is the apt title of this photo of the traffic circle in downtown Troy. The picture, by Devin Brautigam, of Sidney, has been accepted in two, international photo contests. SIDNEY — Devin Brautigam, of Sidney, owner of From Above Aerial, has four pictures in three international photography contests. All of the photos were shot with his drone. The next step was getting a pilot’s license. Drone-flyers must be licensed if they want to reproduce the photos they shoot with their drones. Brautigam studied hard for two weeks and then went to Dayton to take the written test. “I got a 96 percent. I was really happy because I’d been really nervous,” he said. An electrician who works for Area Energy and Electric in Troy, Brautigam began taking pictures around Sidney in his spare time. The drone, which he had purchased from a French firm specializing in aerial photography, had been customized for his use. It has carbon fiber wings, is about the size of dinner plate and weighs just a quarter of a pound. It runs on a lithium battery. He went to a popular Face Book page, “You Know You’re from Sidney…,” for inspiration. “I saw a lot of old pictures. I wanted to try to recreate them with modern technology. My drone has HDR. It shoots in 21 megapixels,” he said. It’s also relatively quiet, a feature Brautigam particularly wanted so he could shoot weddings. “When you’re saying vows, you don’t want a helicopter overhead,” he laughed. Within a few weeks, the new photographer established From Above Aerial as a business. 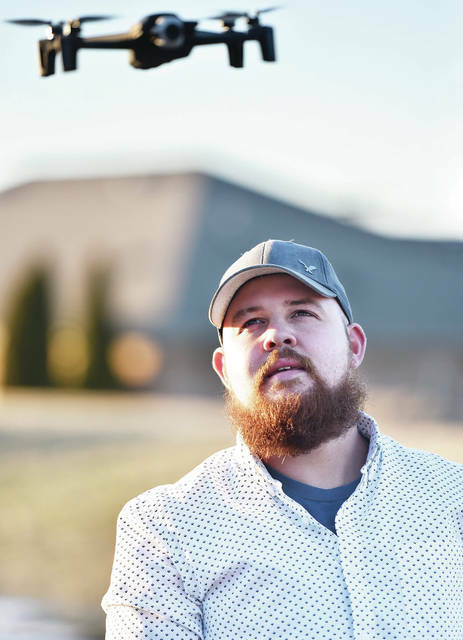 He has shot promotional videos for the city of Troy, a wedding, events at Fulton Farm in Troy, the Shelby County Fair, Fairlawn Local Schools’ graduation ceremonies and the Miami County Fair. He will shoot Versailles’s bicentennial celebrations this spring. Some of the videos contain inside shots. One part of the Troy promotional piece was taken inside Grandpa Joe’s Candy Store in downtown Troy. The drone flew through the shop, capturing the brightly colored confections in a rainbow swirl of movement. “I like videos more than stills because it brings people memories. It creates a story. With a video, you can relive (the event),” Brautigam said. He may like videos more than stills, but that doesn’t stop him from waiting for hours in all kinds of weather to get the perfect still nature photo or from recognizing the artistry in the pattern of a cityscape. 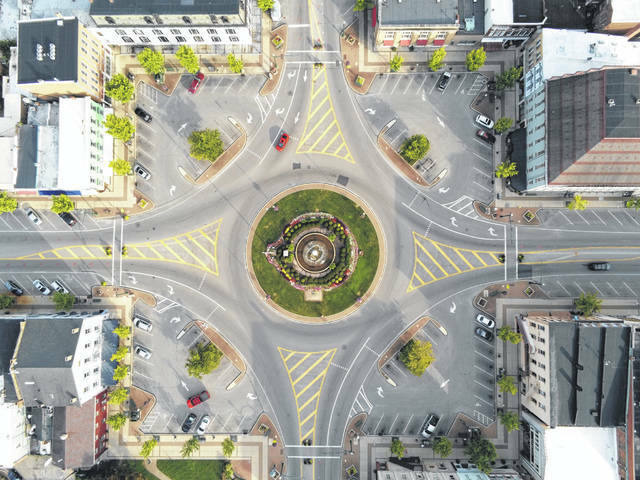 A photo looking straight down on the traffic circle in the center of Troy — a photo he’s titled “Simple Symmetry” — has been accepted into the juried competition run by the Smithsonian magazine and is also entered in the International Fine Arts Photo Competition. A third picture, this one of a frozen waterfall in Tawawa Park that’s titled “Ice Tunnel,” has been submitted to International Photography Grant, where judging is under way and will be announced mid-April. “With that one, the jury critiques it and gives feedback,” Brautigam said. So it was worth it to brave the cold to get the shot. “I knew it was cold. Water freezes. So I got in my jeep and went riding around (looking for a good photo). Your brain is on fire. That’s what photographers call it. It takes over. It’s passion,” he said. He’s waiting now for the perfect day to get a photo of the Lockington Dam. He put a photo of the Big Four Bridge into grayscale and then manipulated it so the bridge stands out in a reflection of golden sunlight. That particular photo was a favorite of Sidney residents who saw it on Face Book. It’s Face Book fans who have led him to the various contests. And he credits John Hemp, of Sidney, with helping him understand what makes good photography. Brautigam earned an Associate of Applied Science in criminal justice at Edison State Community College and served as a cop in St. Paris for two and a half years. He had no experience as a photographer when he got the drone. “(Hemp) is a great guy. He gave me a lot of tips,” Brautigam said. “I picked up the drone and took a picture of the courthouse in the morning.” He posted it on Face Book and people responded. “I’d like to land a spot like that somewhere. I watch it for hours for ideas,” he said. In the meantime, he has a goal closer to home. To reach From Above Aerial, call 937-489-6175 or visit its Face Book page.